The only quick way off the islands is via helicopter evacuation. 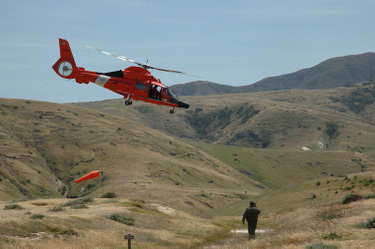 This Coast Guard chopper was demonstrating evacuation, and exercising the crew's skills, until a boat fire in the channel called them away. Helicopter evacuation is costly -- $10-20K -- and if you are riding the chopper out, your problems are serious. It's one life experience that I hope to miss. 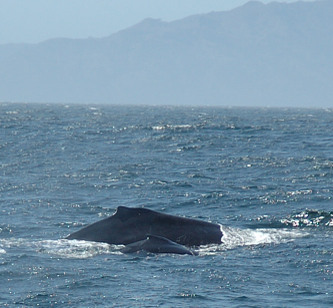 Mother-and-calf humpback whale pairs are not uncommon in the Channel Islands. Humpbacks like to be group members; in fact, cooperation is important in some of their feeding strategies. Humpbacks seem to enjoy the plentiful schools of baitfish in the channel: sardines, anchovies, topsmelt, and jacksmelt. This pair was between Anacapa and Santa Cruz. A young whale has a lot to learn. Channel Island foxes are found nowhere but the islands. 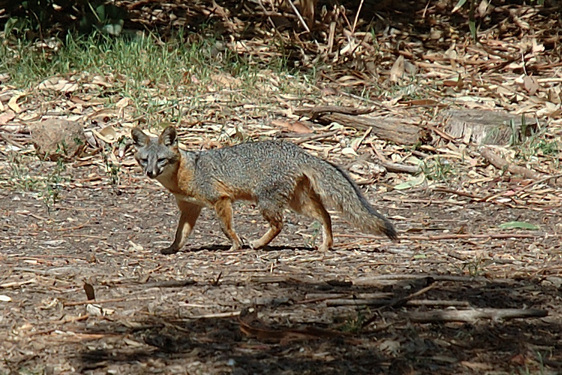 The Santa Cruz Island foxes comprise a distinct subspecies. They are about the size of house cats. After reaching near-extinction, they are now increasing in population in the wild. This one is in its native environment, on Santa Cruz. Recently a pair at the Santa Barbara Zoo gave birth to a pup. Items humans built and used find another life on the sea floor. Santa Barbara Channelkeeper replants eelgrass beds at the Channel Islands. These beds provide nurseries for young marine creatures.